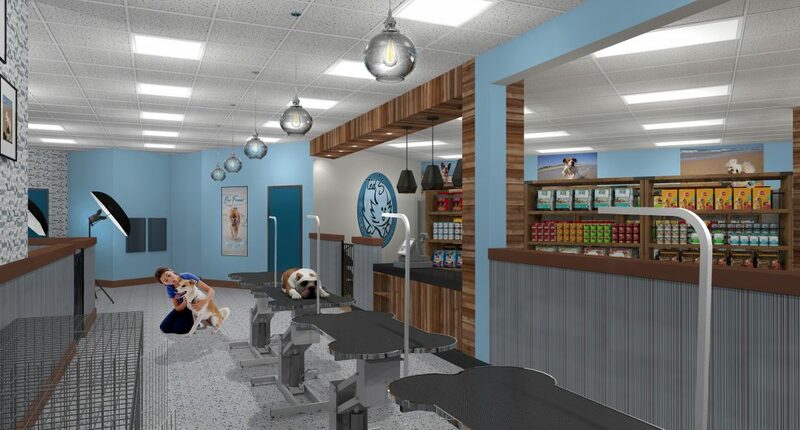 A fun project that we recently completed in San Diego is Ted’s Grooming Emporium, a pet store plus dogs grooming salon, all in one. Designed for dogs only, the store has a clean, playful interior, where cold tones mix with the warmth of wood. The name of the store comes from that of the owner’s pet, Ted, the unofficial CEO and president, whose picture is displayed in the store. 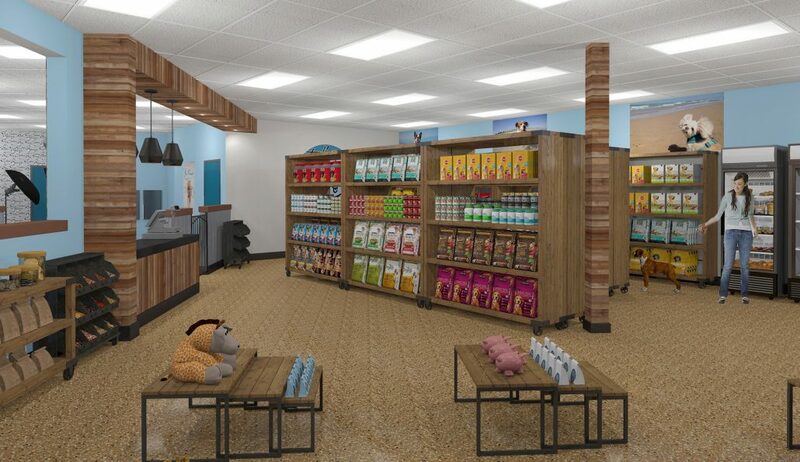 Ted was more than just the good spirit behind this entire pet store interior design project. He was also the inspiration for the store’s logo, which was provided by the owner. In order to create an interior in line with the logo, that could be part of a cohesive branding strategy, we used the same tones of blue as a starting point in our design. We added gray hues to complete a cold-tone palette that gives the place a sense of freshness and cleanliness, then we generously added wood accents for balance. 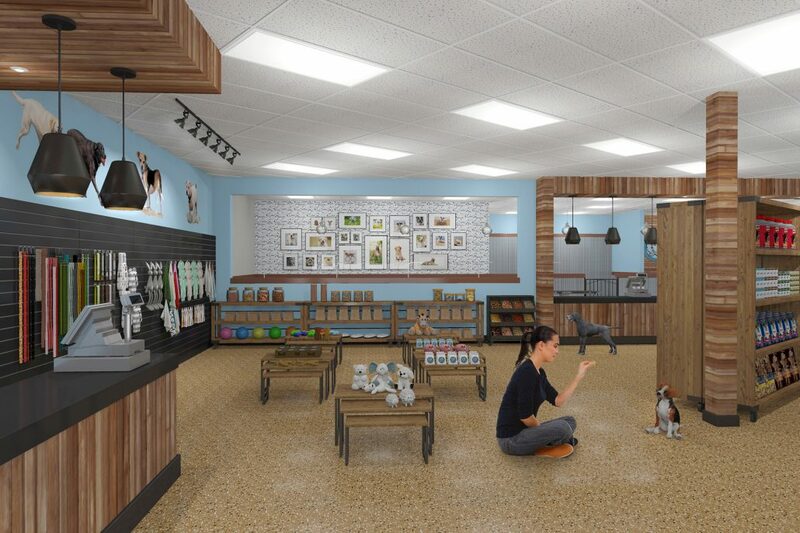 Wood was also the unifying element that brought nature inside and that lined and emphasized all the elements of this pet store interior design. It was used to embellish structural elements, such as support columns or the ceiling, and continued on the front side of the counters. Easy traffic was essential and playtime encouraged, so we allowed for generous floor space and opted for easy-to-move wooden shelving that we combined with nesting tables as another shelving option. The store has a number of functional areas that keep with the color theme and the cheerful spirit of the place. Bone-shaped tables welcome the dogs for grooming in a well-lit area, while shelves full with treats are always close. 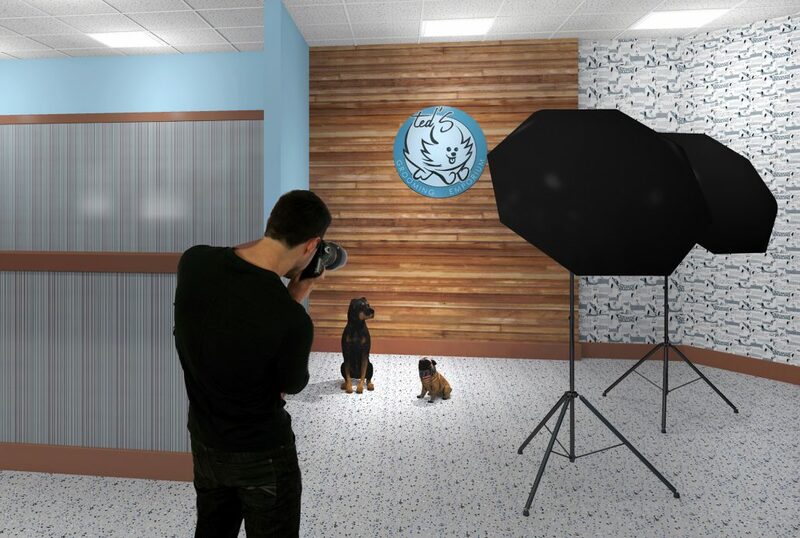 There is also a charming photography area where the clean dogs can take nice shots against a beautiful wooden wall. Because we tried to keep the color range in check, we added variation through materials and patterns. We combined paint, wallpaper and shiplap to match the spirit of playfulness that the store needed to reflect. We opted for a dog-themed wallpaper that we paired with thin stripes, and used dog photography high on the walls and for an adorable wall gallery. The different floor colors emphasized the different areas – an epoxy floor that pulled all the grays and blues together in the grooming and photography area, and a brown one in the shopping area. Black accents here and there, such as light fixtures, countertops or wall tiles, give the interior a touch of sharper color contrast. Finally, while we made great use of recessed lighting in order to flood the place with light, we added some modern fixtures for extra charm and to soften the angles of the space. 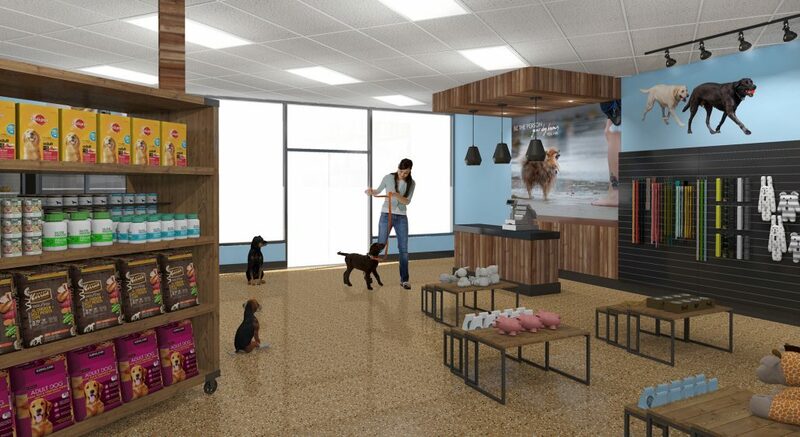 In the end, we created a pet store interior design that is colorful yet orderly, full of visual energy yet cohesive.